Wake tubing off of Leeward Beach, Providenciales. Tubing in the beautiful waters of the Turks and Caicos with Talbot Tours. 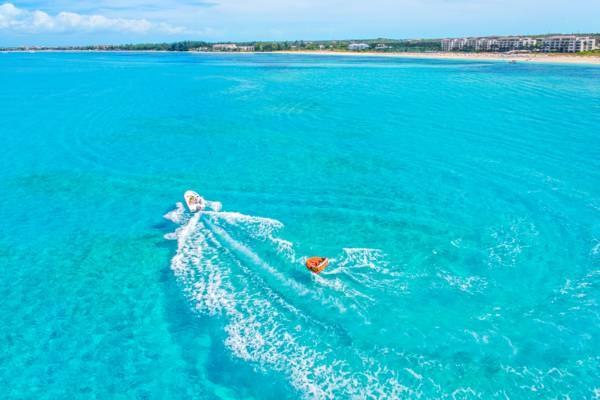 Tubing is a popular activity on Providenciales, and is simply an inflatable tube ride or banana float towed behind a powerboat. 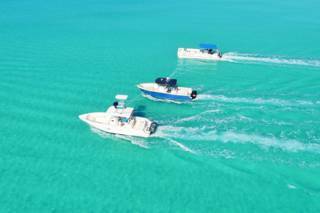 It's an exciting and easy way for just about anyone to get on the incredible water of the Turks and Caicos. The most common of these towable rides are the large banana and shark shapes, which are suitable for up to eight people, however, the smaller lounge chair and tube types that seat one, two and three persons are probably more fun. Unlike wakeboarding and waterskiing where the rider holds a bar with the line from the boat, wake rides have the line directly attached to the inflatable. Wake rides generally require no training and only a safety brief prior to participation. 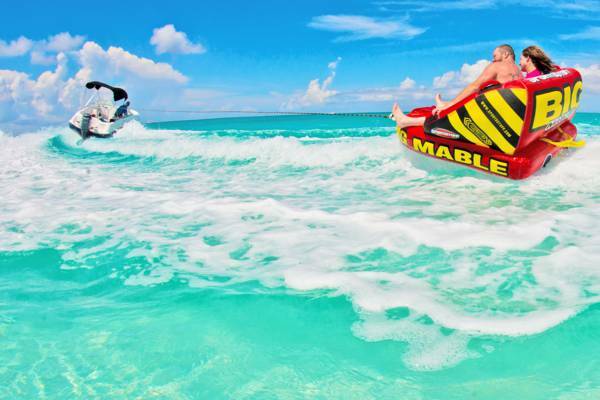 Tubing is popular off all of the beaches within a short boat ride of the Grace Bay area. These regions include Grace Bay Beach, the Bight Beach, Leeward Beach, Half Moon Bay, and Water Cay. Tubing at Grace Bay, Providenciales. There are quite a few ways to set up this activity. If you’re planning on a boat cruise, keep in mind that many of the popular island hopping excursions include tubing. Tubing can be reserved in advanced through a custom charter as well with many wakeboarding companies. This water sport can also often be arranged directly on Grace Bay Beach. We recommend that you ensure that the ride operator you deal with is both licensed and insured. Local law requires that each boat have a minimum of two employees: a captain and a full time spotter. Life vests should be available to all riders and must be worn by children. If a boat does not meet these requirements, we suggest that you look to a different business.